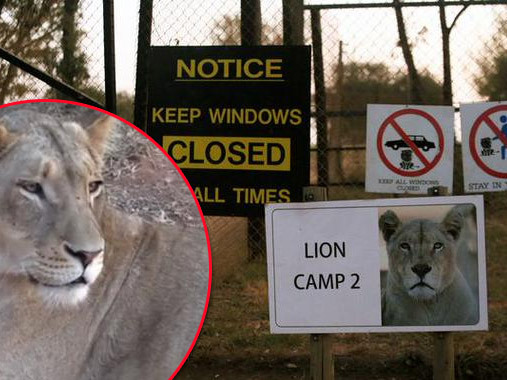 The American woman killed by a lioness in the Lion Park on Monday had ignored several signs and verbal warnings not to drive through the area with her car windows open. "The main rule was broken, not to have windows down. That is the number one rule and if people followed that, these incidents wouldn't happen. Ninety-nine percent of people do follow the rules," the park’s assistant operations manager Scott Simpson told reporters. According to Simpson, there are more than 40 signs, both with pictures and text, warning visitors to keep their windows rolled up and stay in their cars. He said the lioness would not be put down. After investigations they would decide whether to move her to another enclosure which was not open to the public. "The only other incident that has happened here was an Australian citizen who was scratched by a lion. He also had his window down. He later admitted that he was being stupid and apologised." Police were still on the scene in Camp 2 late on Monday. At the entrance to Camp 3, signs warn visitors to keep their windows up and stay in their cars. Simpson said the lioness attacked the victim through the front passenger window around 14:30. The man who was driving sustained scratches trying to fight her off. He was taken to hospital. Simpson would not release her name. She is believed to be an American in her 30s. Her details had been sent to the American Consulate for it to inform her family. The man with her was believed to be a local tour guide, but this had not been confirmed. Simpson said they had 200 000 visitors a year and this kind of thing rarely happened. A shop assistant who spoke to some of the witnesses said other people had warned the couple to roll their windows up during the drive. She said camp staff were on the scene in seconds, chased the lions away and performed CPR on the woman before paramedics arrived shortly afterwards. She died on the scene. Police spokesperson Colonel Lungelo Dlamini said they had opened an inquest docket.